The Big Wheel is now mounted to the table…easily removable for servicing because it slides into place and is held by just one screw. Disconnect the chain…unscrew the screw…slide. Or, after started, will stop the big wheel after one revolution. All mechanical. I had considered using Arduino and magnets but decided that if one of these Big Wheel Lifts ends up in Europe somewhere (220v) I did not want to have to deal with the electronics. As is…a simple motor switch out will do the trick if 220v is the destination. There will be a hand crank also…personally I find it pleasant to crank these things. I have a micro switch on order and expect to have this motor driven sometime next week. After it’s under power it will be tested for hours and hours and then disassembled for paint. At this time am thinking pale shades of green with a burnt orange highlight. We’ll see what my wife says…she has a good sense for colors. The Big Wheel attaches to it’s table by sliding in groves. 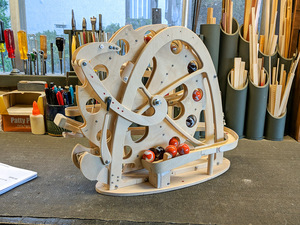 Now that the test stand is completed and I have an understanding of the geometry of the powering mechanism, I am able to create the table (on which the automata will sit) and the mechanical frames (below the table that will contain the sprockets and cams and followers and motors, etc). Some of you may notice that I don’t use a lot of straight lines when I create. I prefer gentle, organic curves. I use french curves frequently when I am roughing out a design. 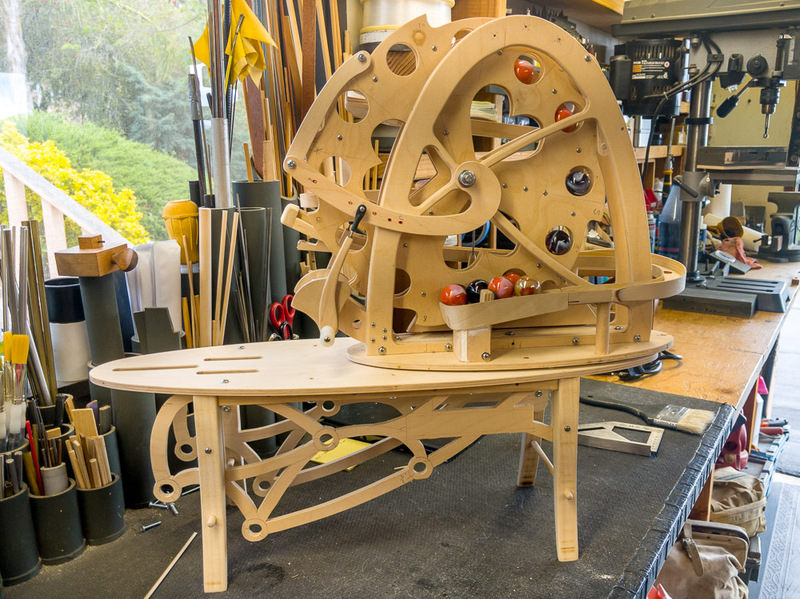 You will note that the table is sized, it’s got legs, and its got it’s mechanical frame. The first mechanical frame is always the most difficult because I need to anticipate everything that the frame will contain. One omission and I need to recreate the frame sides, which takes a long time. This next week will be spent adding the powering assembly (the biped, motor, cams, chain, etc.). I suspect that within two weeks I’ll have the entire Big Wheel Lift #2 under power. 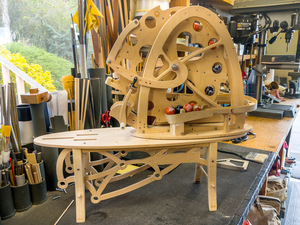 In mid stages of creation, Big Wheel Lift #1 and the table and mechanical frame. The image to the right shows just the bare test stand, however as of this writing the test stand is fully operational. Not pictured are the cams, the bearings, the motor and chain. I’m pleased with the test stand and feel comfortable that I can use the geometry on the actual Big Wheel Lifts. 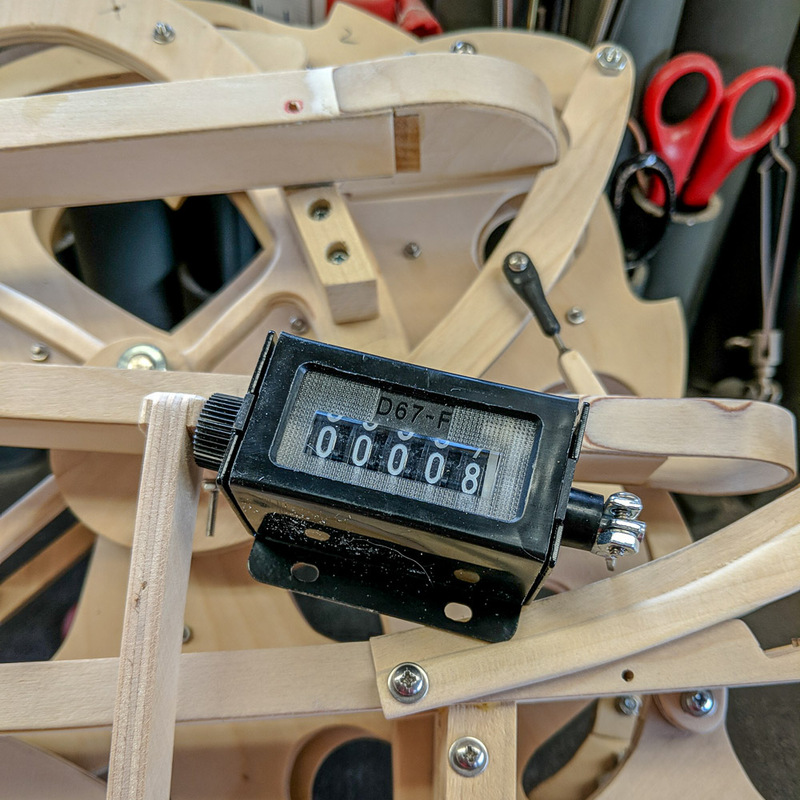 I’ve got a 4 watt electric motor powering the test stand and it seems to be very adequate. After hours of operation the motor is warm…not hot…and it is very quiet. The biped does 1,200 cycles per hour and has exercised now for about three hours. It’s interesting working in the studio and having this little guy exercising on the work bench next to me. In a weird way it’s sort of like having company. Here is a link to the video on YouTube. Else view below. The Big Wheel Lift series biped test stand (prior to cams, chain, and motor). 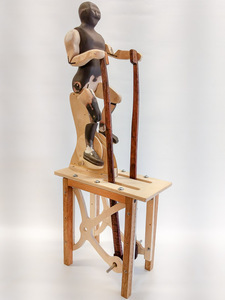 All of the Jim’s Gym series automata work with the concept of a biped (a Jim’s Gym Club member) exercising. The power for the Big Wheel Lift is generated by a biped pedaling and pulling levers. 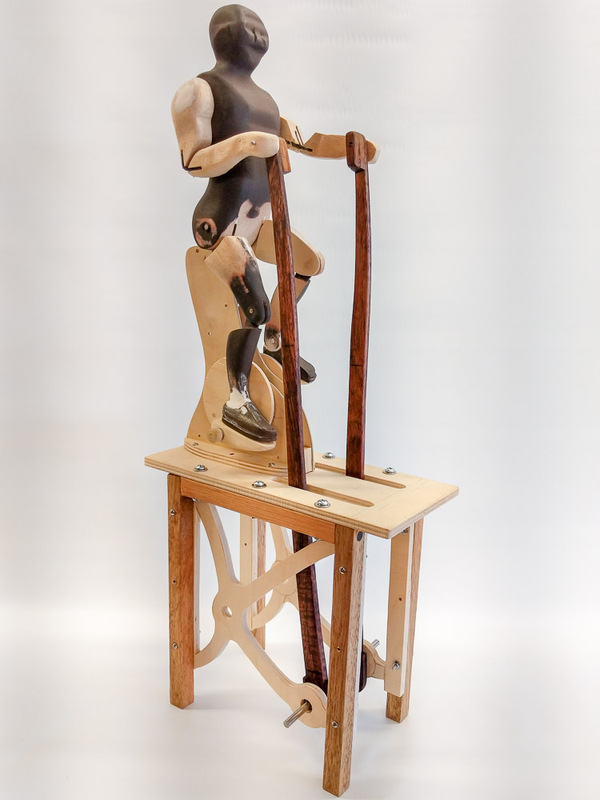 I’ve not yet created a biped pedaling…so for a little more than a week have been focused on the pedaling part of this automata. 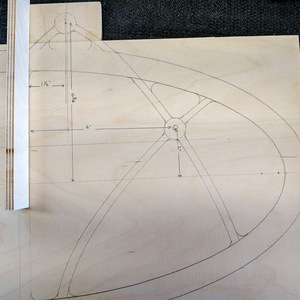 Part of the process is simply figuring out proper geometry and dimensions. Then the construction process must allow everything to fit and to operate smoothly. In the Jim’s Gym series I want all of the bipeds to be the same size, and in fact I am hoping to be able to create them all to the same template. I also want them to be able to easily be removed from the assembly. It quickly became apparent to me that the axle for the pedals, and the pedals themselves were not going to be a trivial piece of work. My goal is always to build durably, with smooth operation for thousands and thousands of cycles. In this case I’m using two ball bearing on the 1/4″ axle, and then nylon bushings for the pedal bearings. All of this needs to be created to relatively small dimensions. I realized that I would not be able to use even #2 fasteners because of their bulk and so would use CA glue. This means that this first pedal assembly must be well thought out before assembly because it will be glued, not screwed, and therefore will not have serviceable parts…but rather will be an assembly that must be replaced as a whole if it develops problems. The goal, of course, is to have no problems. The pedal assembly that you see in the image to the right is a portion of a biped test stand which I am making specifically for this Big Wheel Lift series. The test stand will be to the same dimensions as those on the actual Big Wheel Lift. The biped will be able to easily be removed because it uses a socket and magnets for attachment. The test stand is powered by a small electric motor. The biped will be put through thousands of cycles before it will be placed into the Big Wheel Lift assembly. I will post a video of this test stand after it becomes operational. Bottom line…just this evening I got the biped pedaling properly. I was simply hand cranking…observing…and am pleased with how it all looks in action. Now to get the levers and the motor installed into the test stand. Perhaps another week…maybe a bit more. 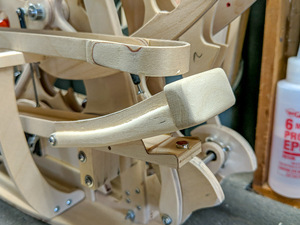 The uncompleted “Pedaling” test stand. I’ve incorporated magnetic shock absorbers into Big Wheel Lift #1. As of this date the big wheel assembly is essentially completed. 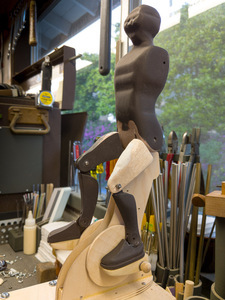 I have started work on the biped section of the automata. Here is a video that shows the shock absorbers in action. This is how the big wheel assembly is looking at this time. Powered only by hand crank at the moment there is still some tweaking to do…but I’m now getting very close to working on the “pedal part” of this automata. Will have some video up in a couple of days. I’m very pleased with how this is coming to life. The big wheel assembly is nearing completion. For a variety of reasons I include mechanical counters into my creations. It’s time to add the counter to Big Wheel Lift #1. I never reset the counters. For example…this one is going on at 00008. When this automata leaves me it will most likely register somewhere near 05000. I plan to do extensive endurance testing with all of these. It’s important to me that the builds be high quality and that these little machines will operate reliably for a long time. As I freebuild I make changes to the design, sometimes recreating parts of the assembly 5-6 times. At this time I’ve got the marbles being raised to the top. Things are not perfect…there is still a long way to go…but I like what I’ve got going here and feedback from the folks in my little world have good things to say. 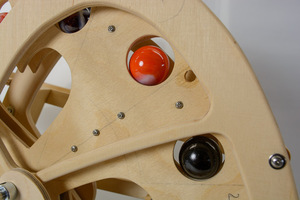 Marbles in the Big Wheel are moved to the top of the wheel. The idea has been in my head. 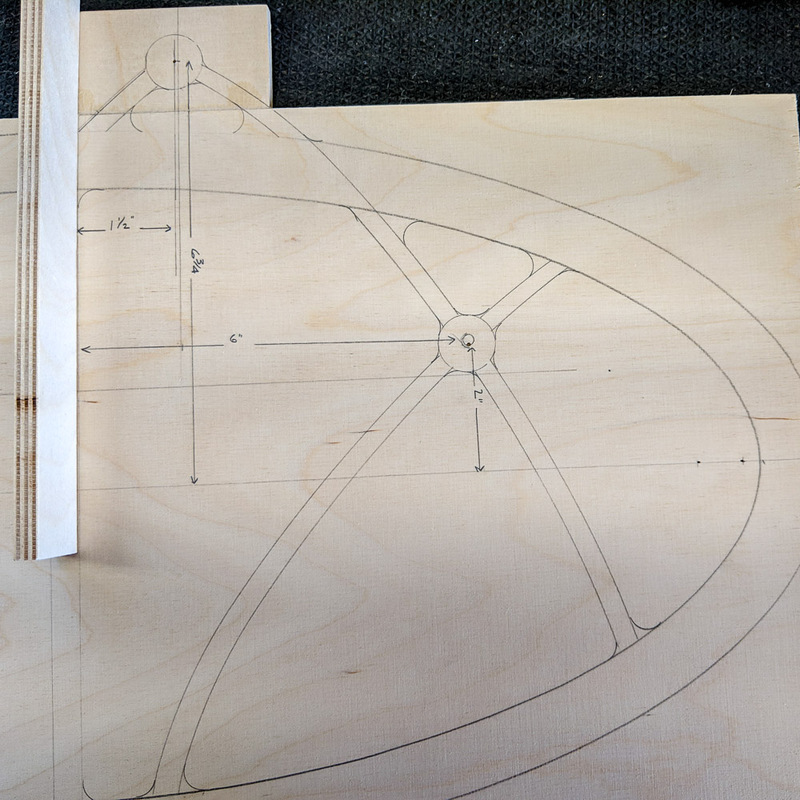 It’s now time to start the freehand build. 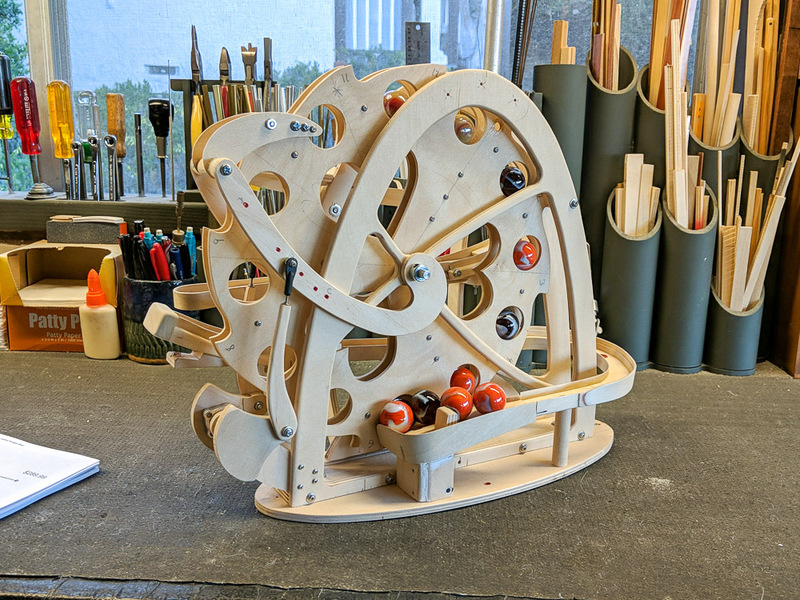 The concept of this automata is relatively simple: A Jim’s Gym member will pedal a bike which will power a Big Wheel which will raise marbles to the top so that they can recirculate back to the bottom. A feature of this automata will be magnetic shock absorbers. 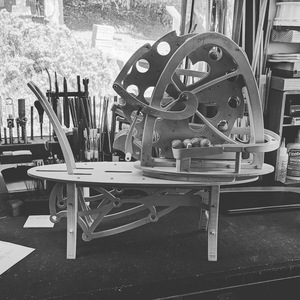 In the image to the right you see me sketching the Big Wheel side frames, which will will be cut from 1/4″ Baltic Birch plywood. It is not unusual to see me using French Curves as I design. I’m not a fan of straight lines.